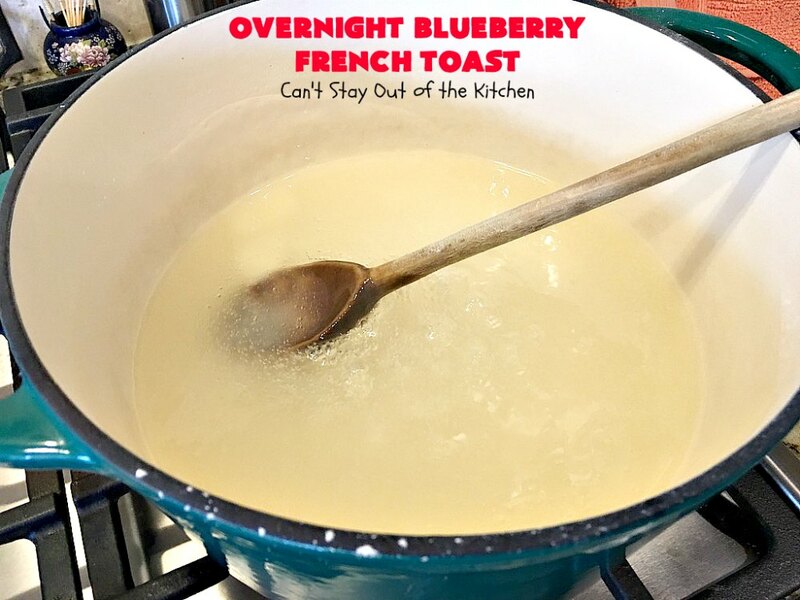 Oh my goodness, Overnight Blueberry French Toast is spectacular. It’s irresistible. Mouthwatering. Drool-worthy. Indestructible. ?? What’s that? I-N-D-E-S-T-R-U-C-T-I-B-L-E. Yes, it is. I don’t think you can mess up or destroy this amazing breakfast casserole. 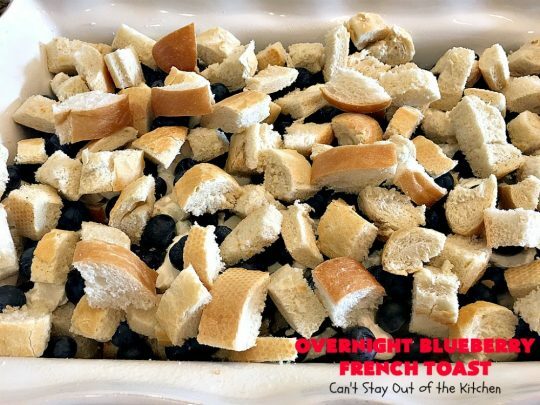 🙂 French bread cubes line a casserole. 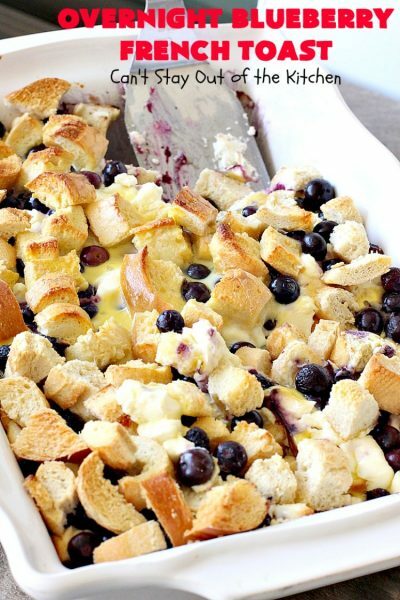 The bread is topped with cream cheese cubes, blueberries and then a custard. You can bake immediately or refrigerate overnight. (I’ve done both). After baking the French Toast, it’s served with a luscious homemade blueberry sauce. 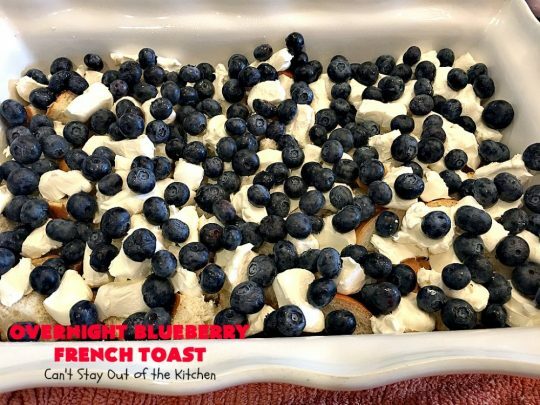 Seriously, all this French Toast needed was ice cream to make it the most decadent breakfast casserole ever! Back in February I signed up to bring meals to one of our host homes for our church’s Disciple Now Weekend for teenagers. I made two of these breakfast casseroles. Well the boys got to bed around 3:30 that morning so they weren’t up for a huge breakfast and only demolished one of them. I got the other casserole back. What was I supposed to do with an unused, already baked breakfast casserole??? 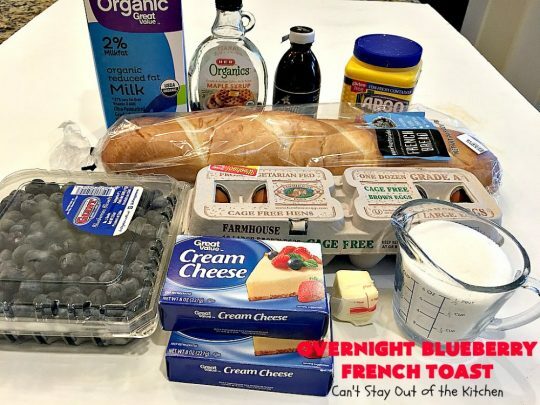 I wrapped it with aluminum foil and froze the casserole and the extra blueberry sauce for several days in my freezer. Then a couple days before our next Friday night care group, I took the stuff out of my freezer and refrigerated it to thaw out. 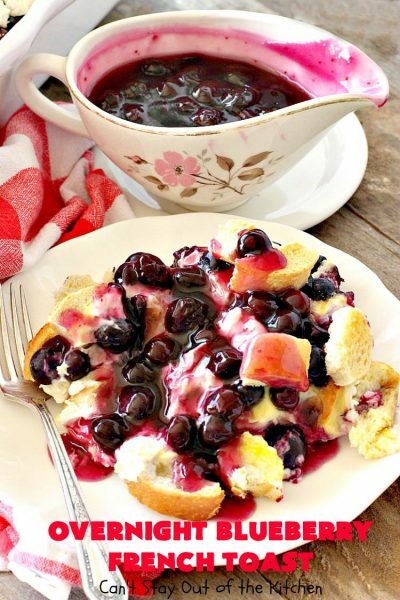 That Friday I re-baked the casserole and re-heated the blueberry sauce. I had no idea how this was going to turn out. Quite frankly, I really thought it would be dried out and taste less than optimal. But that wasn’t the case. It was fantastic. In fact, I even prepared my guests saying, “uh, I’m not sure if you’re going to have to spit this out or not….” Everyone loved this casserole even though we had a delicious dessert on the menu. Several people actually had two or three servings! 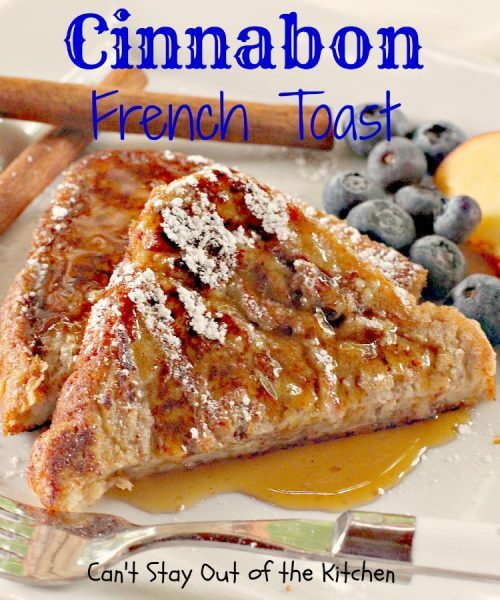 French Toast never tasted so wonderful. 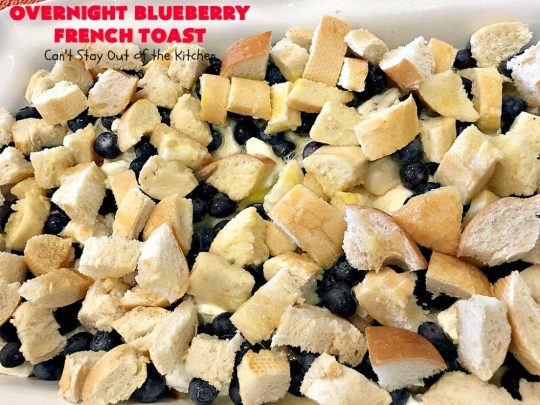 The first time I sampled this amazing casserole was several months ago when one of the guys in our care group made this for “Breakfast for Dinner,” one Friday night. It was so awesome I bugged him for the recipe so I could make it for the youth breakfast meal. But I’m really glad now that I made too much and we got to serve this again as leftovers. All of us salivated over it. 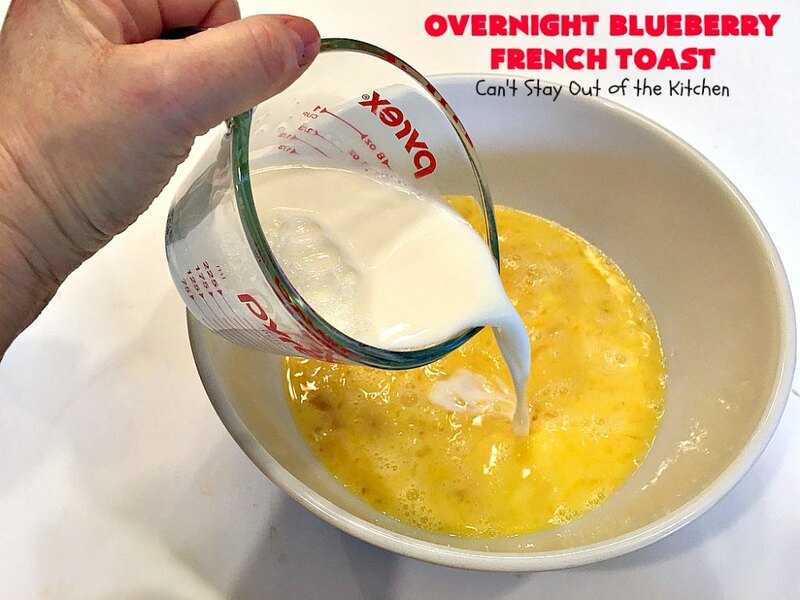 Seriously, Overnight Blueberry French Toast is indestructible. 🙂 And if you want the most decadent breakfast for Mother’s Day or Father’s day then you’ve got to make this amazing recipe. You will be drooling after the first bite. No kidding. 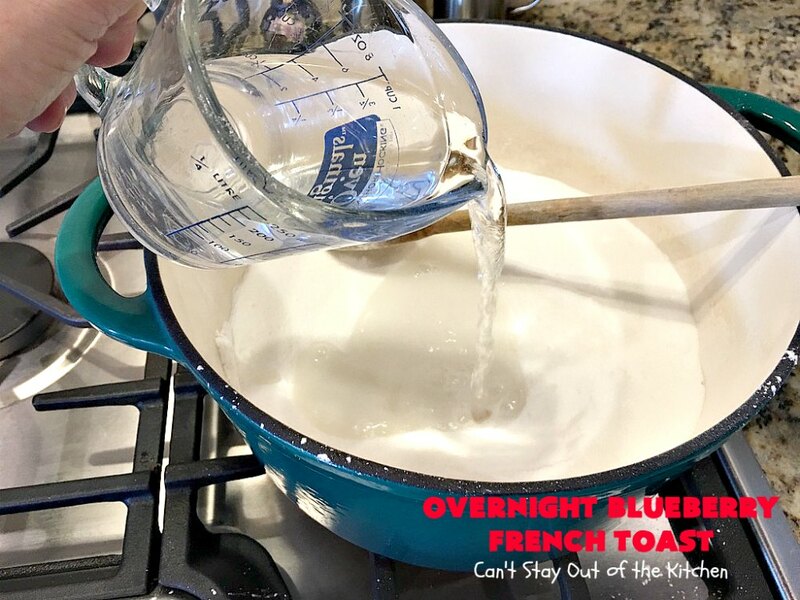 Overnight Blueberry French Toast is one of the most delectable, decadent breakfast casseroles you’ll ever eat! This overnight breakfast recipe is perfect to make for holiday breakfasts. Just bake the next day and you have a hot breakfast for company. 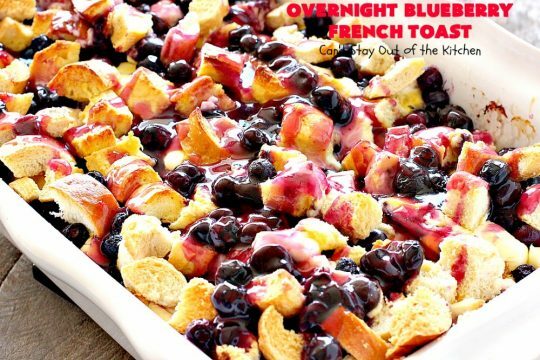 All this casserole needs is a little whipped cream or ice cream to make it the biggest splurge ever! Cube French bread and place in a greased 9×13″ glass baking dish. 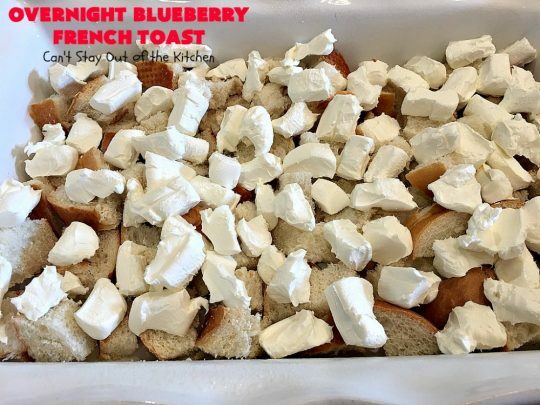 Add cubes of cream cheese. Add part of the blueberries. 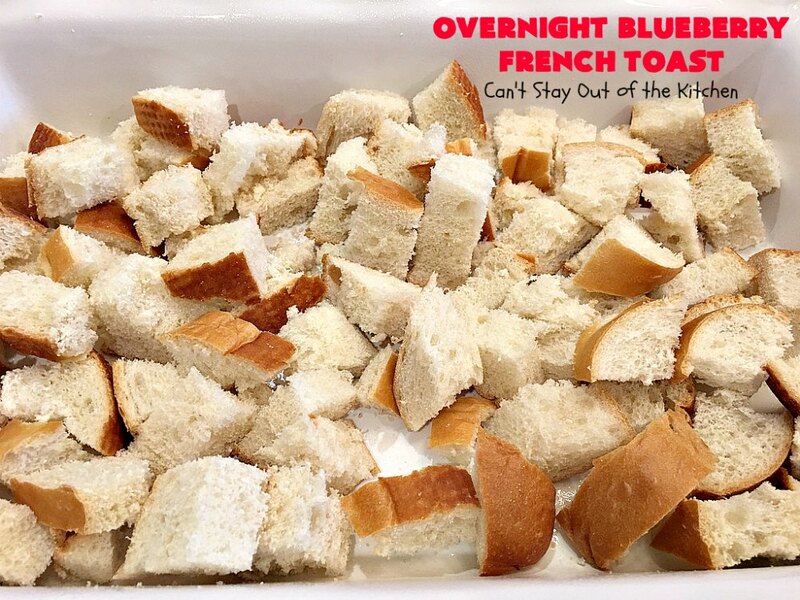 Add remaining cubes of French bread. Pour over top of bread cubes in casserole dish. Cover and refrigerate overnight. Combine sugar and cornstarch and place in a saucepan. Add water. 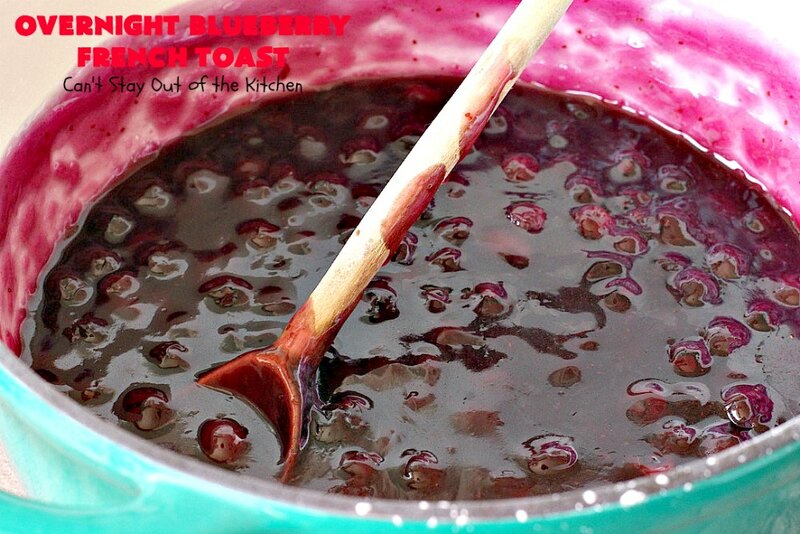 Add blueberries and cook about 10-20 minutes until the mixture thickens and the blueberries burst. Add butter and stir to combine. Remove from heat. Refrigerate and warm up the next day with the casserole. Set casserole out on counter about 30 minutes before baking. Cover casserole with foil and bake at 350 about thirty minutes. Uncover casserole and bake an additional hour or until custard is set in middle. 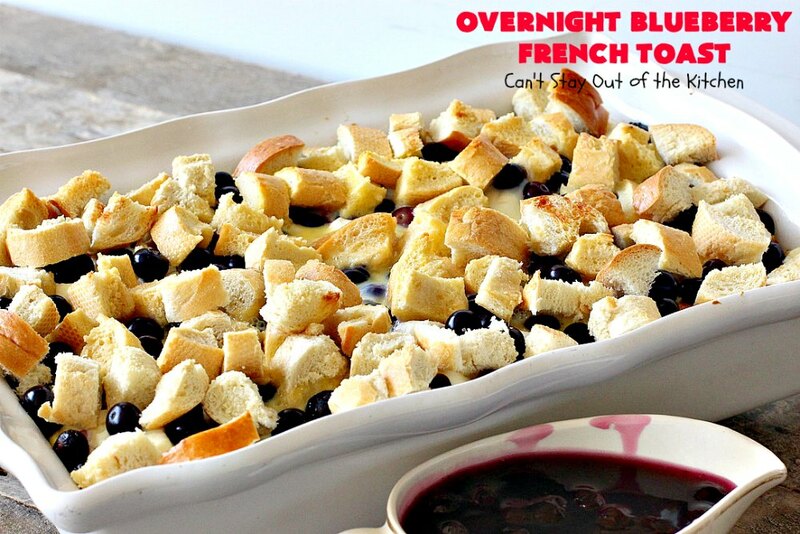 Serve with warmed blueberry sauce. 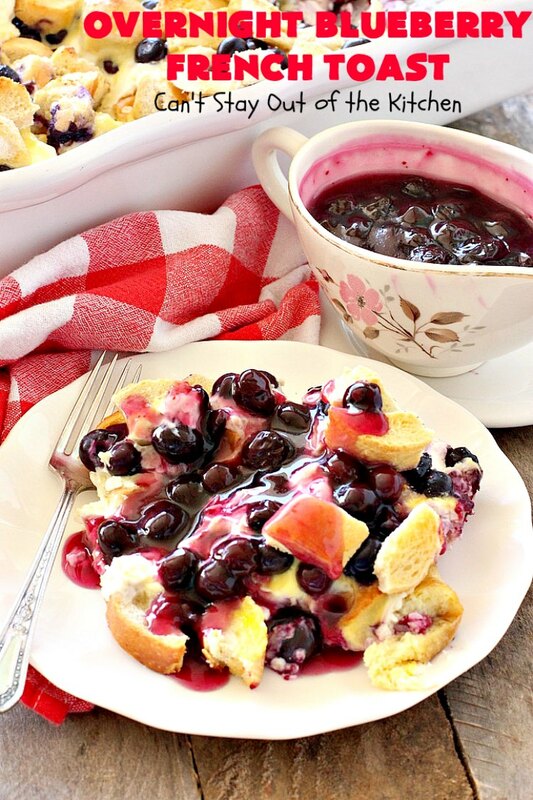 You can drizzle blueberry sauce over top as well as ladle it over top of each portion of breakfast French toast. Seriously, every mouthful of this French Toast is delightful. (Recipe adapted from Brad Mayes, Ovilla Road Baptist Church, Ovilla, TX; source: adapted from All Recipes). 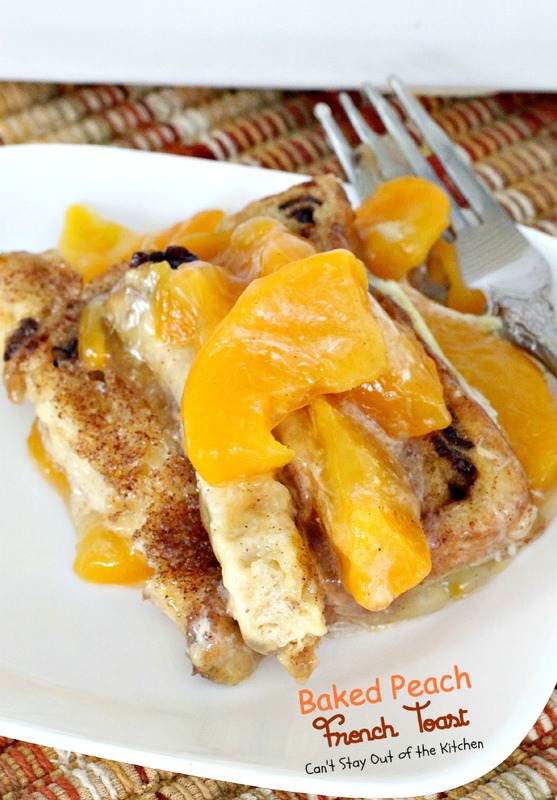 This is one of the richest, most decadent French Toast casseroles ever! 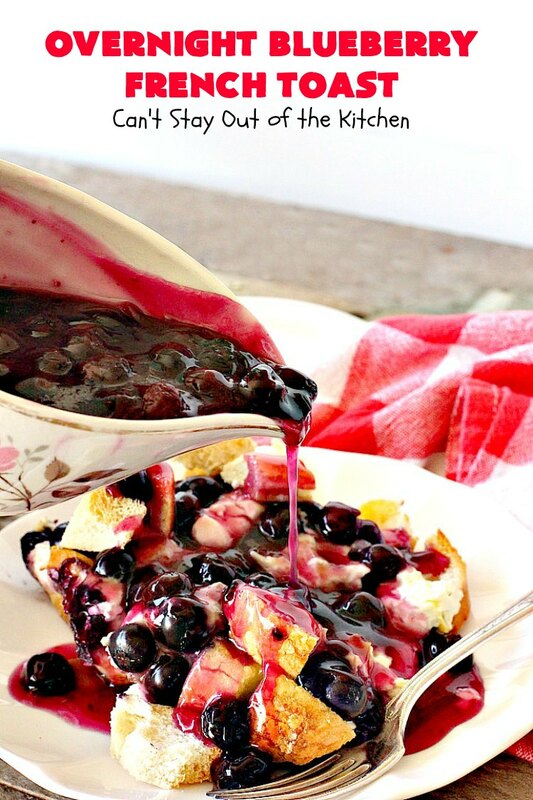 This fabulous breakfast casserole is loaded with blueberries, cream cheese and then drizzled with a homemade blueberry sauce. It's perfect for holidays like Easter, Mother's Day or Father's Day. Lightly spray or grease a 9x13 inch baking dish. Spread half the bread cubes in the prepared dish. Top bread cubes with cream cheese cubes. 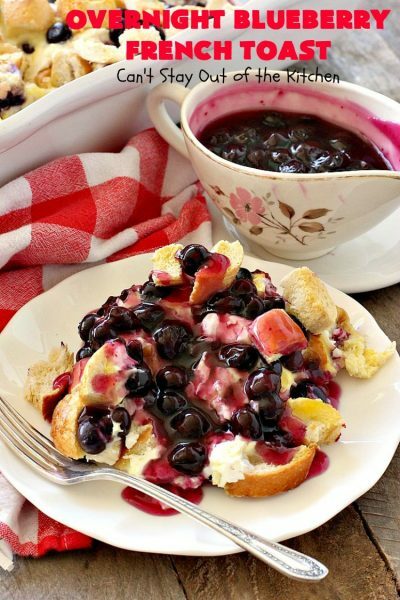 Sprinkle 2 cups of fresh blueberries over top of the cream cheese cubes. Top blueberry layer with remaining bread cubes. Meanwhile, in a large mixing bowl, whisk the eggs, milk, vanilla extract, and syrup. Pour egg mixture over the bread cubes. 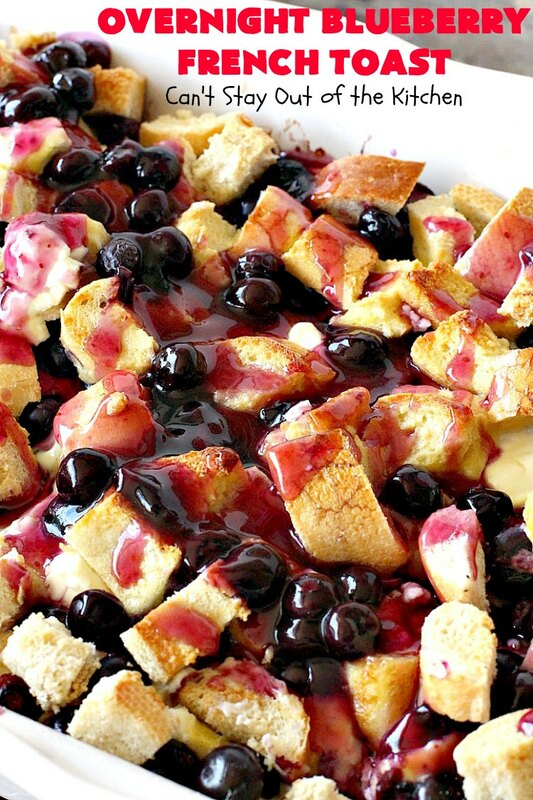 Remove French Toast mixture from the refrigerator about 30 minutes before baking. Uncover, and continue baking 25 to 30 minutes longer. The center should be firm and surface lightly browned. In a medium saucepan over medium heat, mix the sugar, cornstarch and water. Cook 4-6 minutes stirring constantly. 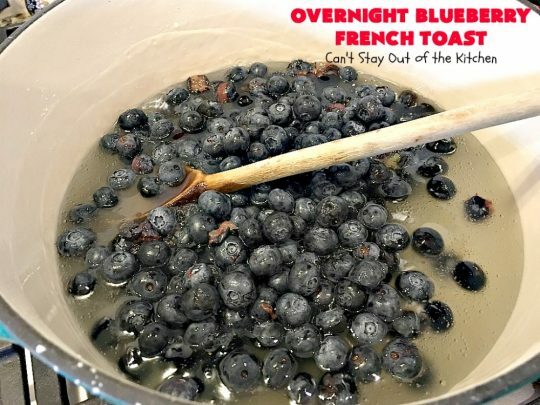 Add the remaining 1 ½ cups blueberries. 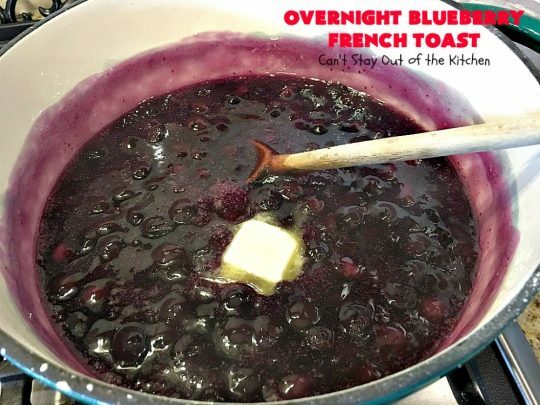 Reduce heat to low, and simmer approximately 10-15 minutes--until the blueberries burst. Stir in butter to combine. 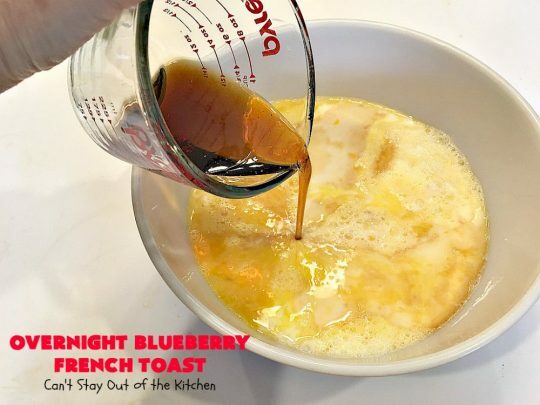 Pour blueberry syrup over top of the baked French toast. 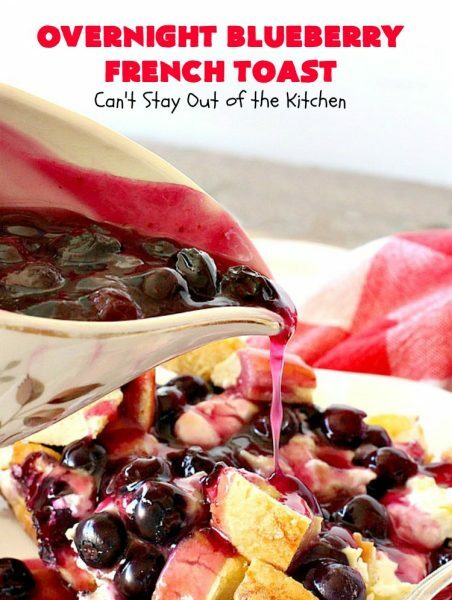 Or serve sliced of Blueberry French Toast and drizzle blueberry syrup over individual servings. NOTE: You need a total of 3 ½ cups fresh blueberries; two cups for the casserole, 1 ½ cups for the sauce. NOTE: I found this recipe needed to cook almost 2 hours before the egg filling was set. I recommend baking it about an hour covered. Then remove the foil and cook an additional 30-45 minutes uncovered, until casserole is totally set. Recipe source: adapted from All Recipes. This is a terrific breakfast casserole for company. If you enjoy blueberries, Overnight Blueberry French Toast is a great way to enjoy them. If you want to wow your company, give this indestructible Overnight Blueberry French Toast a try today!